Direct Lender Payday Loans - Where are they banned? We’ve touched on the topic of state regulations concerning direct payday lenders many times. In previous blog posts we’ve answered your questions about different financial issues. This includes why direct lender payday loans are banned in some states while others have little to no regulation. We’ve also discussed why there is so much ambiguity when it comes to online lending regulations. There are hundreds of rules and laws in place that control lending in each state alone. Even with all that, we continue to get questions from consumers all over the country regarding the legality of cash advances! For example, some consumers want to make sure a specific payday loan direct lender can offer loans in their state. Other consumers want to know if they can be harassed for non-payment of a loan by any of the large direct payday lenders. The questions go on and on! I guess we shouldn’t be surprised that there’s so much confusion when it comes to cash advances and title loans. Much like other financial products, each state has their own rules when it comes to what type of direct loans are allowed. Also, there are some states, that ban short term loans all together. So, you could have states where payday loans direct lenders are legal, or banned all together! We hope to see the some big changes implemented over the next few years that all states would adopt in uniformity. Over the past few months we’ve seen many small fly by night direct payday lenders exit the business. This occurs because of increased oversight on behalf of the government. This isn’t necessarily a bad thing. Many of these fly by night direct payday lenders were skirting the laws and were only looking to make a quick buck. There are still decent companies(both online and offline) that fund direct lender payday loans to consumers online. Feel free to check out our updated List of Payday Loan Options from Direct Lenders, if you’re looking for a short term online loan. We’ve created a nifty infographic to better help you understand the legalities of online payday loan regulations in your state. 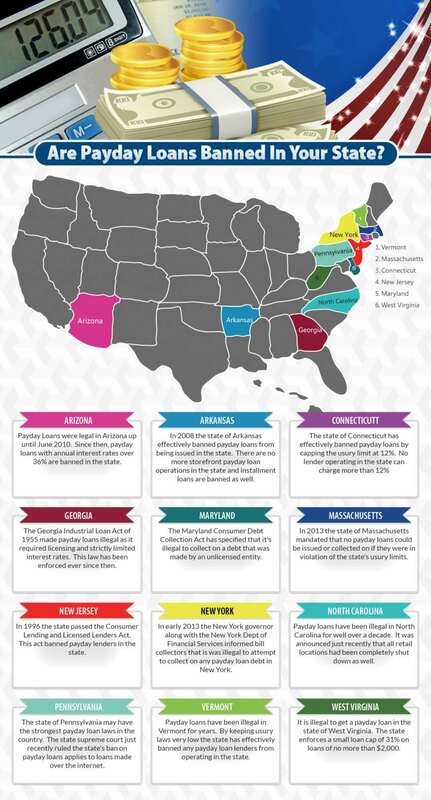 This infographic lists the states that currently outlaw direct payday loans in some form or another. We’ve detailed a notable event or recent legislative change in each state’s history that’s led to direct lender payday loans being outlawed. Keep in mind, there are a handful of states with legislation pending that could render this article obsolete. We’ll do our best to keep this infographic updated with the latest state by state changes. Please don’t rely on this infographic or anything else on our site as legal advice on payday loan rules and regulations. We are not a law firm and we don’t offer any legal advice or recommendations on cash advance legalities in your state. Use this image research your options before you make the move with a direct lender. Make sure you really need an online loan before you sign at the dotted line with any company that offers direct lender advances! If you feel a payday loans direct lenders is your only option then be sure to pay off your loan in full on the day it’s due. Failure to do this will result in your paying much more than you planned on in interest and fees. You’ll also get stuck in a pattern of taking out one online loan only to pay another online loan. Don’t let this happen. Take charge of your finances and make sure that you do your research to find a good company. Good Luck and enjoy our infographic!